SUBMITTED: There is a post about me that needs to be deleted please. The person who wrote it is not the person who was mad at me, it was a family member of theirs. The woman who was mad overreacted to a flirty comment I made to her boyfriend and felt I was trying to steal him, when it was just an insensitive comment, which I apologized for. She told some family/friends and then one of them took it upon themselves to post it here. The post has now put my job with United airlines at risk, as they have been made aware of the post naming/shaming me, so the social media rules of conduct have been violated within the company. I am at risk to lose my job, my dream job, which pays my bills, and I’m utterly devastated. I haven’t been able to sleep and have become severely depressed. The woman who was upset, Tina Beaman, has tried to get the person who wrote it to delete it since she has forgiven me. She has also contacted you herself as well asking for it to be deleted. I have more proof of conversation screenshots that she (Tina Beaman) wants this Dirty post deleted and is trying to help me get it done as well since the person who wrote it hasn’t replied to her request. Due to already having a large online presence for my business (before I became a flight attendant), this is ruining my reputation for this as well. What can Tina and I do to get this removed? I can’t take much more of this. Perverted men are messaging me and trying to add me on facebook. My cell #, which is linked to my business and online, is getting disgusting messages from strangers asking how much I charge, if I am open for business. I’ve never dealt with this before or had my reputation tarnished, and I’m at a loss. It sounds like you are actually considering removing the post. That’s a first! You admitted flirting. 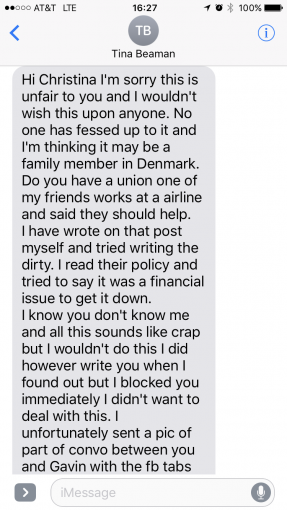 Blaming a family member in Denmark makes sense to you? Your friend Tina is lying to you. She opened you up to this humiliation. If you already work for united, why are you posting your phone numbers online? Not a smart move. Change ur number.. Block Tina and move forward with your life. Removal requests are a good way to make largely forgotten back page stories that failed to ignite critical interest front page news again.